Summer is quickly approaching and the time to spruce up the backyard is here! 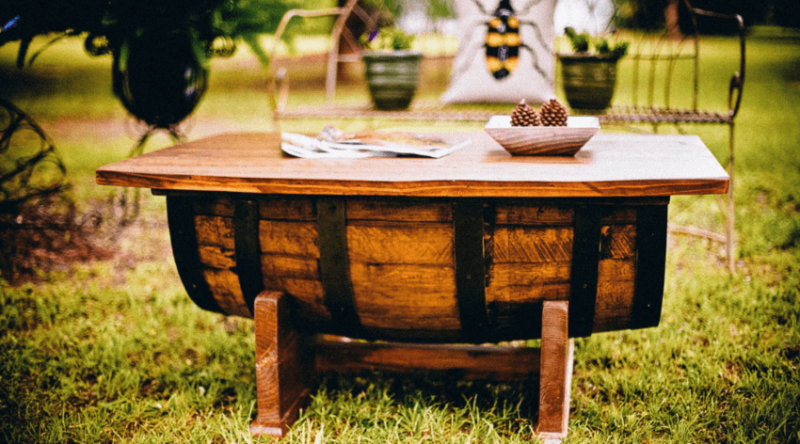 Whether you’re working with a large backyard space or a smaller front yard area, some of the best lawn décor can be up scaled from items you can find around your own home. One of the most versatile items you can use in your yard are used tires. These wonderful rings of rubber can be painted and decorated to create fun planters or unique pieces for the garden. You would have probably thrown those old tires away anyways, so why not reuse them to create something beautiful? Not only are you recycling, but this would be a fun project for the whole family to be involved in. 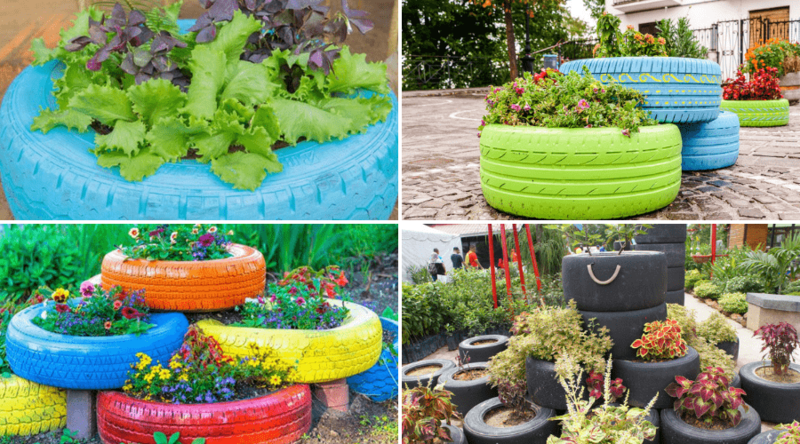 Once you start painting and decorating your tire planters, your creativity will soar and the possibilities will be endless! Check out our nifty list of ideas to help get you started! Here’s a super fun idea that will have neighbors dropping by just to see how you did it! 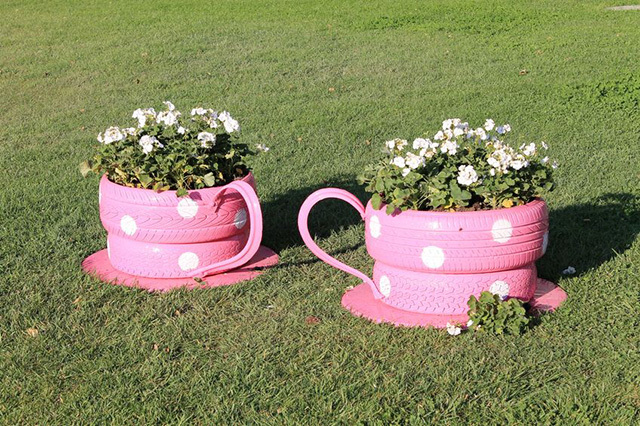 Turn old tires into cute teacup planters! With a little paint and imagination, tires will magically transform into delightful little teacups that will look like you’re getting ready for a whimsical tea party. The kids will love it and these are so easy to construct, all you have to worry about is finding the white rabbit. This is such a cool idea because you have so many options for versatility. Stack tires to make a sort of planter “wall” to showcase different plants. Make it colorful by using all kinds of paint and flowering plants that really pop. Don’t stop at just paint, though, feel free to hot glue rhinestones, use glitter and see what kind of ideas pop up. 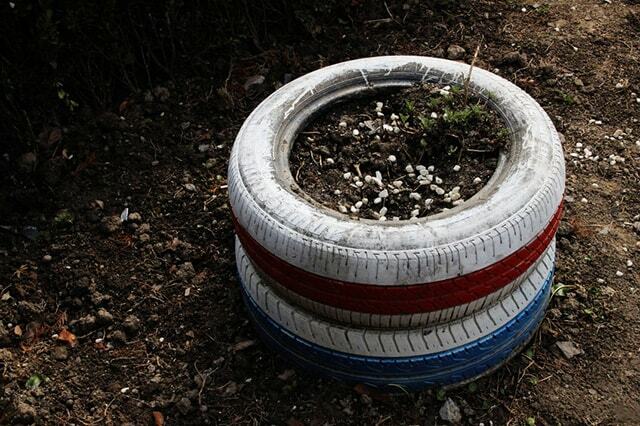 Old tires make the perfect planters because they’re sturdy and deep enough for plants to take root. 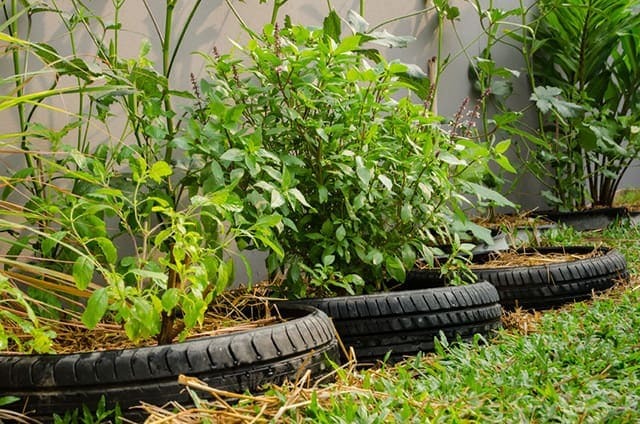 Utilizing tires to create your own garden is not only a smart idea, but it’s eco-friendly. Reduce, reuse, recycle – and you’re hitting all those with these fun planters! 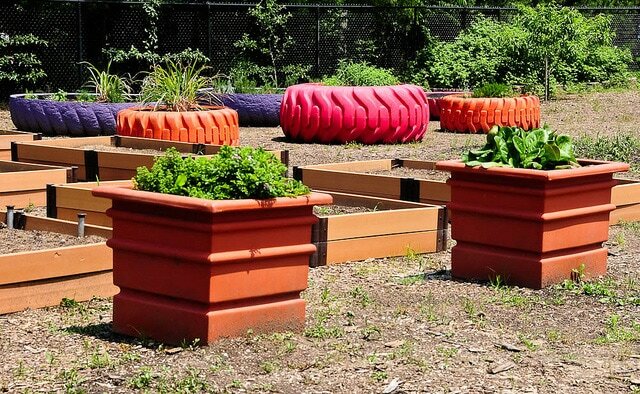 Whether it’s an herb garden or organic veggies you’re planning, tire planters are the way to go! 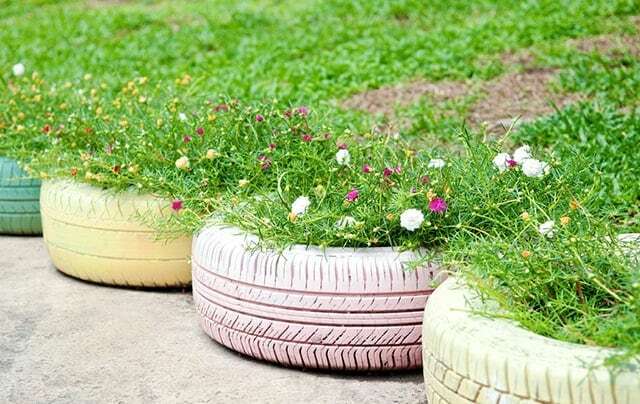 Use tires as décor for already potted plants by creating a tire terrace. Mixing and matching colors between the pots and tires will make an even more interesting effect. All you really need for this project is paint, and of course, you’re previously potted plants. The tires encircle the pot creating a unique lawn decoration that could even deter garden pests such as insects and rabbits. 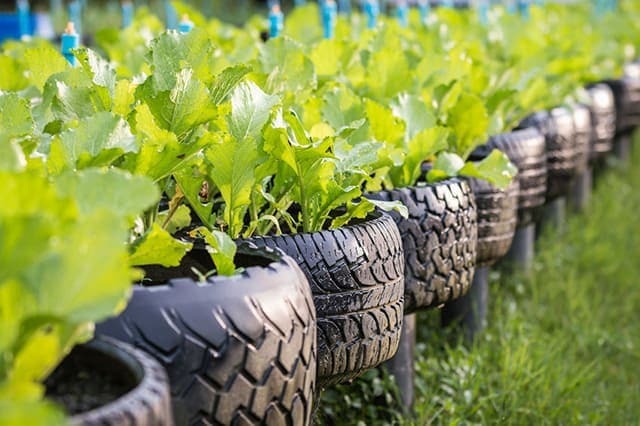 Turn tires into great vegetable planters that can withstand sun, rain and colder temperatures. Going an extra step to lift the tire planters on a ledge or platform of some kind can also help reduce pest infestation. You can easily paint the tires for some color or just leave as-is for an interesting effect. The tires are deep enough and tough enough to safely house all kinds of vegetables. Kick your tire vegetable garden up a notch by cutting the top side of the tire to create a unique design. This is such a great idea because this is a relatively easy activity that can add so much more character to your garden or any outdoor living space. Scallop the edges or create your own cool design that will draw a lot of attention. Something about tires reminds me of kids – probably because tire swings and kids go together like peanut butter and jelly. By utilizing tires as pots for a playground or outdoor kid area, you are keeping that “young at heart” feel intact. Add some fun colors and you have great sturdy planters that are virtually indestructible, aka super kid friendly. This is a super great idea that would require a wider tire, preferably. 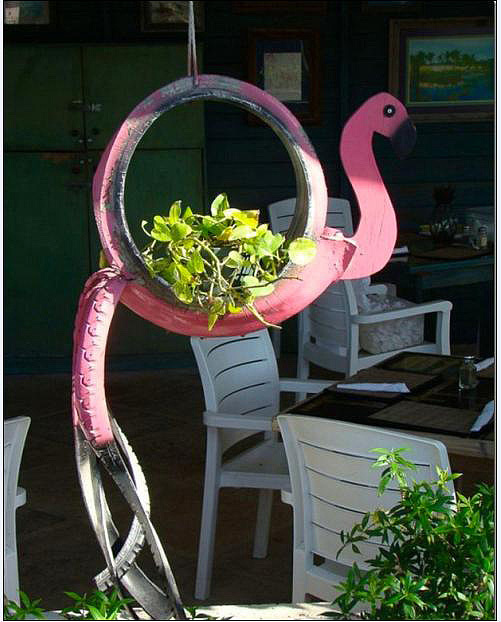 Instead of using the whole tire as a planter, cut away excess to create a fun flamingo planter complete with tail feathers. You can easily add dirt to the inner ring of the tire to plant some succulents or a delicate fern. Hang this from your patio for a great summer animal planter that doubles as a new friend! 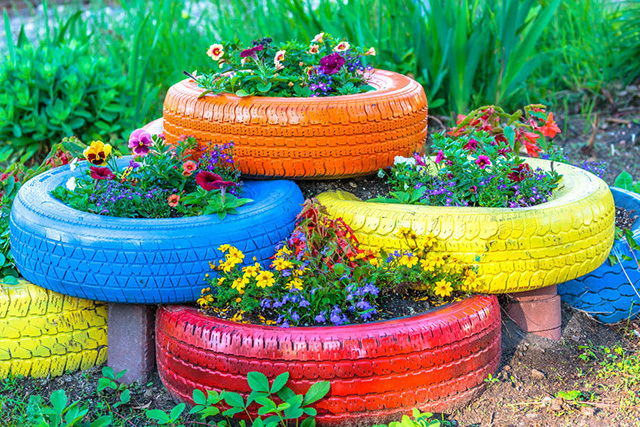 Switch it up entirely by using tires for outdoor art instead of strictly planters. Using paint and the stacking method, recreate your favorite cartoon or seasonal characters just like this frog! This is a super fun idea for homes with children, since kids can easily help with the project and can help recreate their favorite cartoon characters instead of just watching them on TV all the time. This idea will definitely take a bit more time than just having a plain tire planter outside, but the end product will totally be worth it. 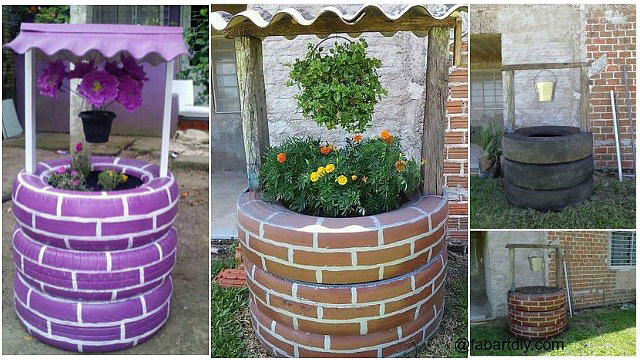 Create your own wishing well straight out of a fairy tale by stacking and painting tires! 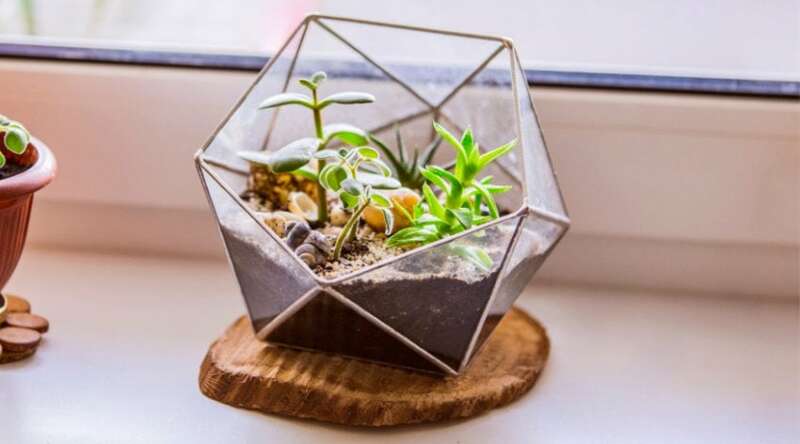 You can get as creative as you want with this design and you can probably find plenty of old materials around the house and yard to use for decoration. 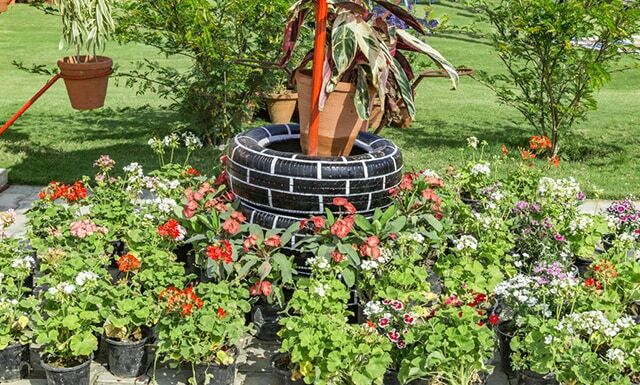 Place your favorite flowering plant or shrub in the middle of the planter and you have a beautiful wishing well. 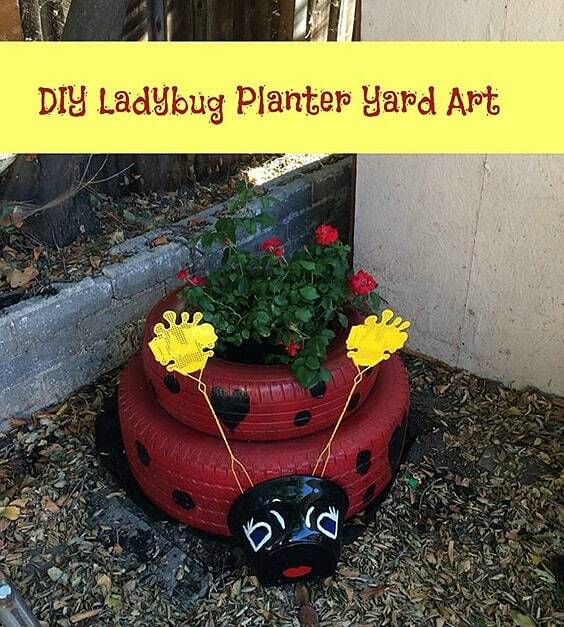 Ladybugs seem to be THE bug of summertime and now you can create your own with this cool ladybug tire planter design! Using plenty of paint and some other materials you can find around you house, you can make a ladybug friend who doubles as a fun planter. This is also a great project for kids since kids typically love bugs, especially ladybugs. I love this hanging tire planter idea. Such a fun, simple way to add so much character to your patio or covered garden area. This is pretty much just like using an old tire for a yard planter, but you’re just hanging them instead of setting them upright. The inner rims of tires are typically wide enough to plant a smaller plant, but you could find thicker tires for larger plants if needed. Spruce it up with your favorite paint or embellishments and you’ve got a totally creative outdoor space! 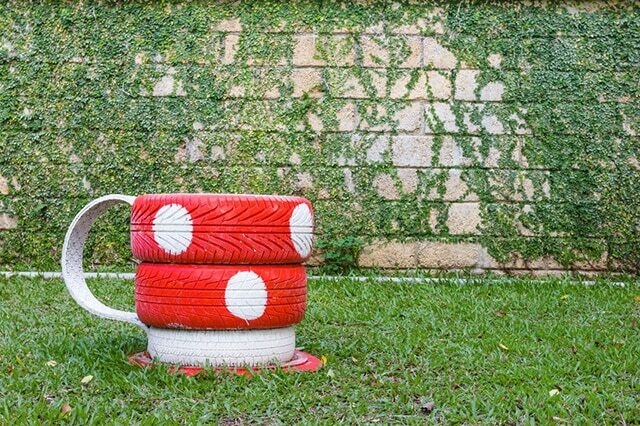 Adhering to the whimsical theme, this is a great idea for a unique stacked tire planter. Stack the tires haphazardly so plants can peek out of corners instead of using the entire tire as a planter. You can stack the tires as high as you’d like, and of course, make it truly unique by choosing a fun color palette to work with. This would be a fun addition to any outdoor space and incredibly unique. Try using a pastel color palette to create a cascading row of tire planters that will truly look amazing. These planters would look great either lining a driveway or up along a fence line. Even setting these up randomly around an outdoor area would look great. The pastel colors against the green lawn or upon bricks would really pop and create an interesting effect. Turn your outdoor area into a tropical jungle by painting tire planters in bold colors. Reds, oranges and deep yellows can recreate your space to mimic the jungles of Brazil. Pick plants that are deep green with long, falling leaves for a truly unique effect that will impress your guests and look absolutely stunning. Palms or ferns could be used to create that effect, but get as creative as you can when it comes to finding the perfect tropical plants. 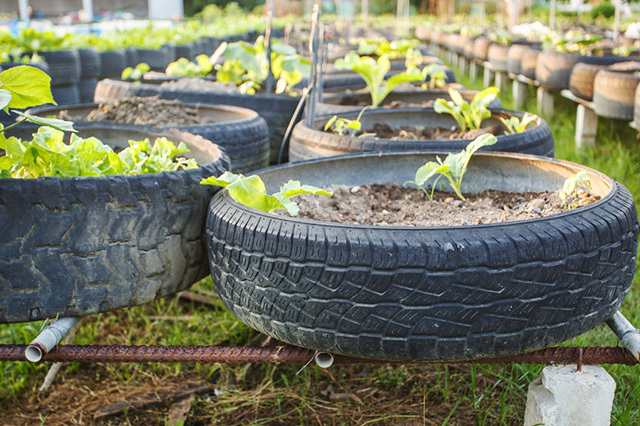 Reusing old tires to maintain a garden is one of the best ways to help the planet. Teach your kids about conservation and the beauty of growing your own, fresh vegetables all while teaching them about the importance of recycling, as well. 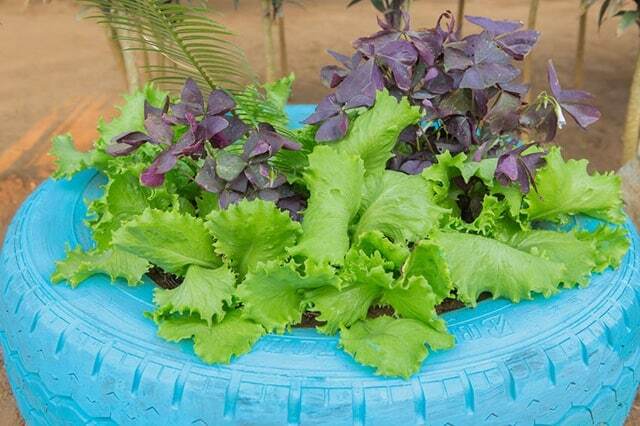 There is no limit when it comes to using tires as planters for vegetables. Imagine picking juicy ripe tomatoes right off the vine in your own vegetable tire garden? Delicious! The sky’s the limit when it comes to having your own veggie farm. 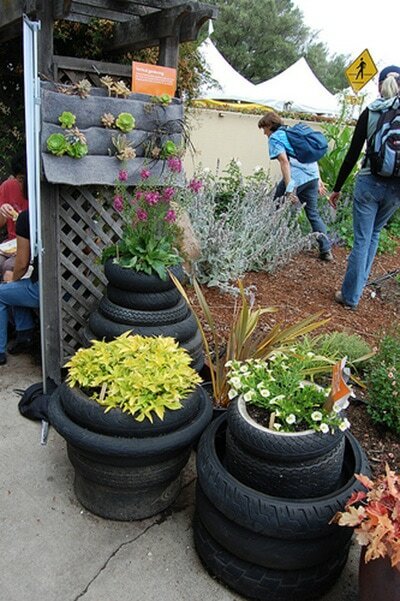 By using old tires as planters, not only are you utilizing an item that would otherwise be trash, but you can find so many of them. Round up tires from your garage, neighbors and friends, and you can pretty much start your own summer veggie farm. The only trick would be setting up your watering schedules. 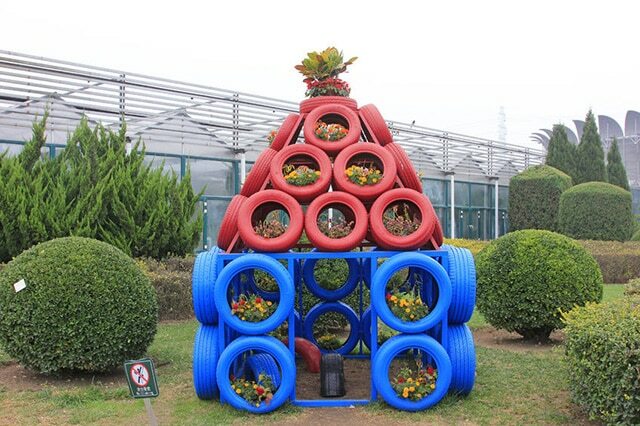 Get as artistic as you like with this interesting concept for tire planter art! 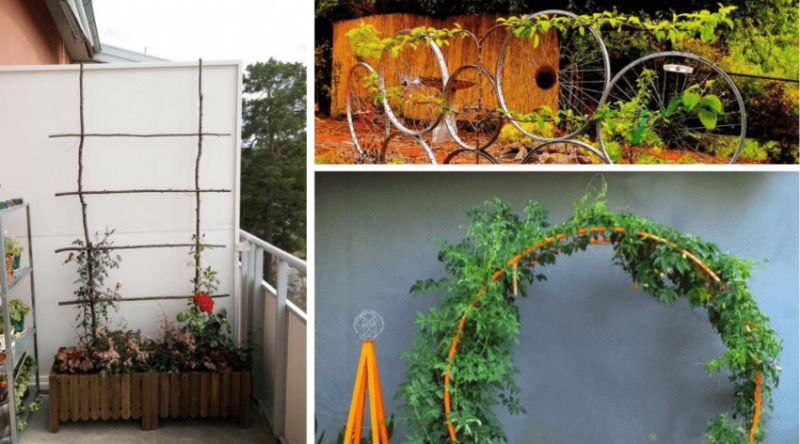 Whether you transform your tire planters into hanging pieces or customize them to wrap around garden pillars, you can transform any outdoor area to suit your taste. Integrating bold and subdued colors can also create an interesting effect. 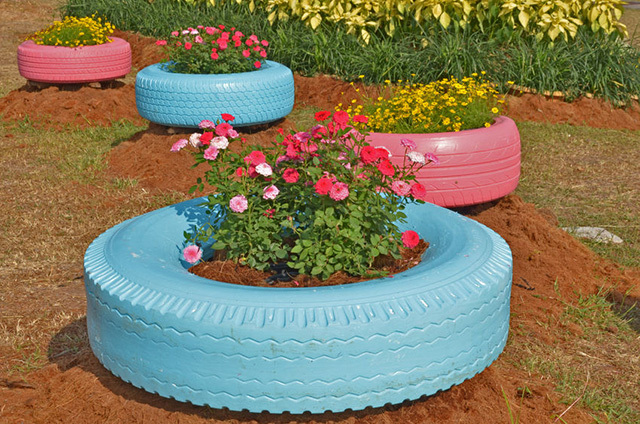 Not only are tires versatile in gardening styles, but you can easily make tires into decorative pieces, as well. Create your own magical play land with the help of tire planters! 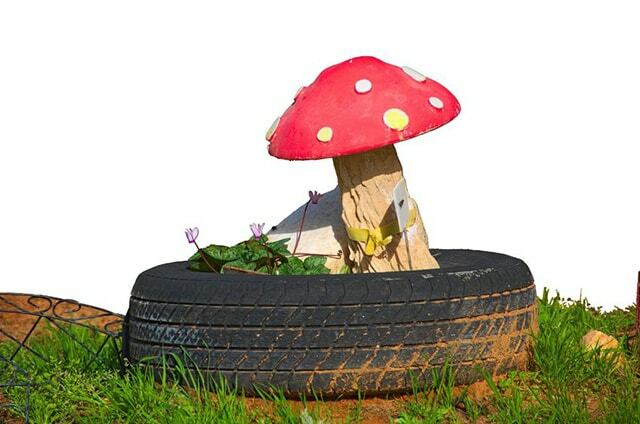 Plant a smaller plant or succulent in the tire planter and add a fun decoration like this mushroom for an enchanting look to a play area or park setting. Get as adventurous as you like by adding fun characters such as rabbits, oversized flowers or even a garden gnome or two. The kids will love it and so will their parents. 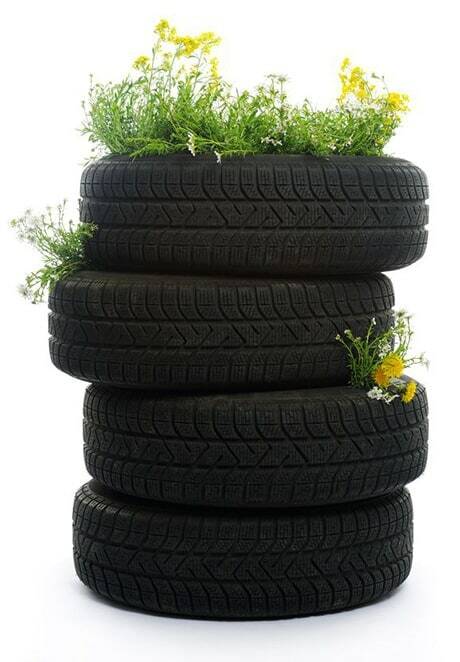 Create gorgeous blooming planters from tires by simply cutting around the top edges of the tire. 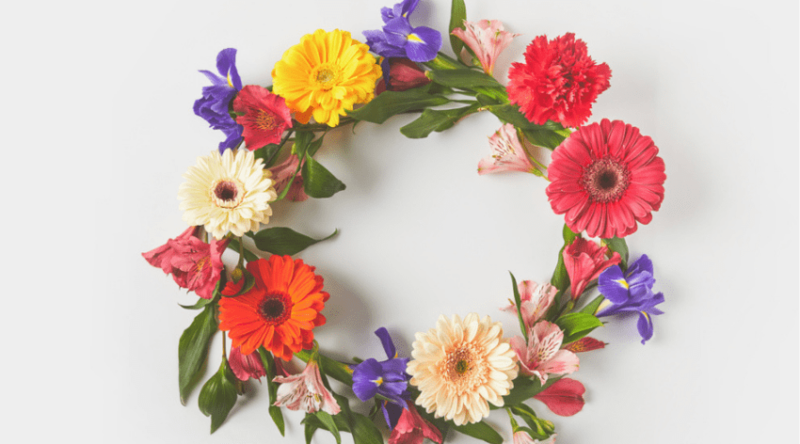 Make flowers blooming open or create an interesting sunburst effect to add some style. You could even glue discarded tire pieces to your design to create a textured three-dimensional effect. Add some paint and you have a beautiful homemade tire planter that will look store bought. 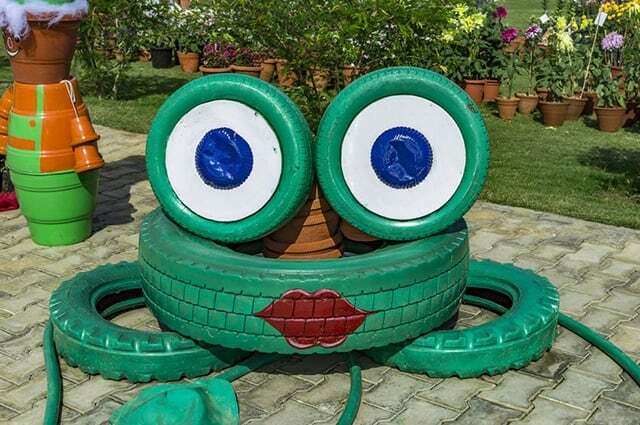 Here’s another fun way to turn an ordinary used tire into a colorful character for the yard. 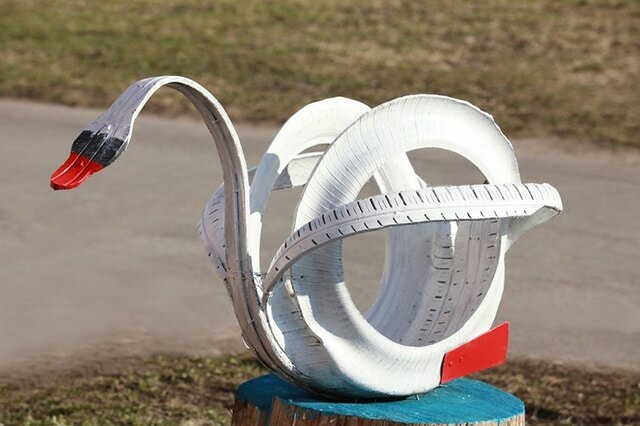 Cut up and construct your own swan planter by using paint and tools you can find around your house. Include your favorite plant inside the swan planter for a fun way to make the most out of your tire planters. Set your majestic swan planter up next to a fountain or water area for added intrigue. This is such a creative idea that your kids will absolutely love! Make a fun house that doubles into an interesting planter structure. 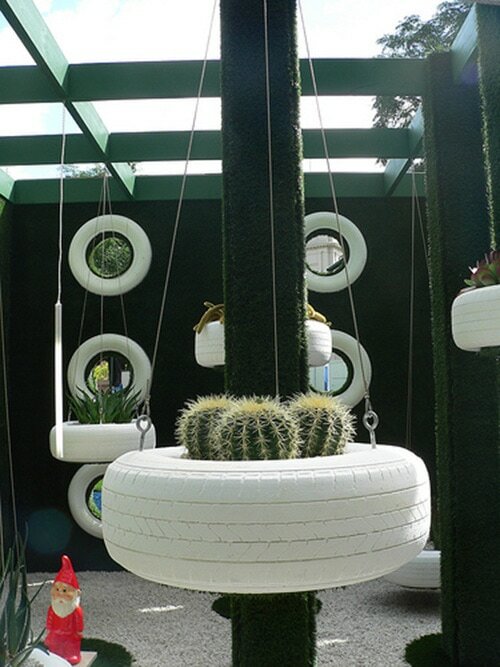 Not only would this create a fun space for the kids to play in, but you can use the tires to plant all your favorite plants or herbs. This incredibly unique concept will be the talk of your neighborhood once everyone sees how creative you are! By stacking tires, you can create a deeper pot perfect for larger plants or small trees if you’re planning to do some creative landscaping. 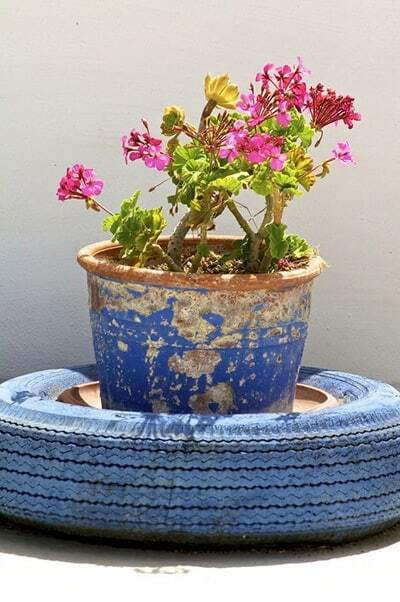 Tires are incredibly sturdy and withstand the elements, so depending on how deep you need your planter to be, you can create a pot that will last. You can even switch up the paint depending on what theme your garden or outdoor area is. This is a great way to save money, too, since large pots can be pretty pricey. 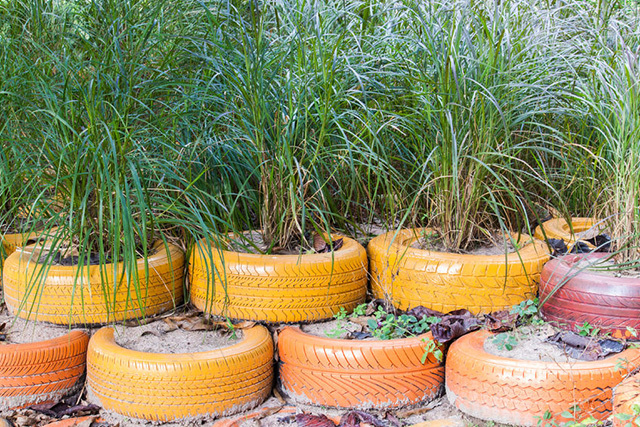 You can find tires in all shapes and sizes to create a unique garden space. 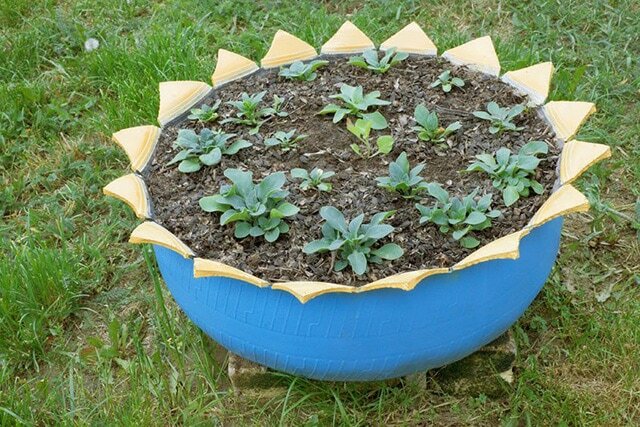 By interchanging larger and smaller tires, you can create planters in all sizes. Thicker tractor tires next to smaller car wheels create an interesting space that can hold all different types of plants. In the larger tire planters, you could even plant several different types of plants for a garden menagerie. 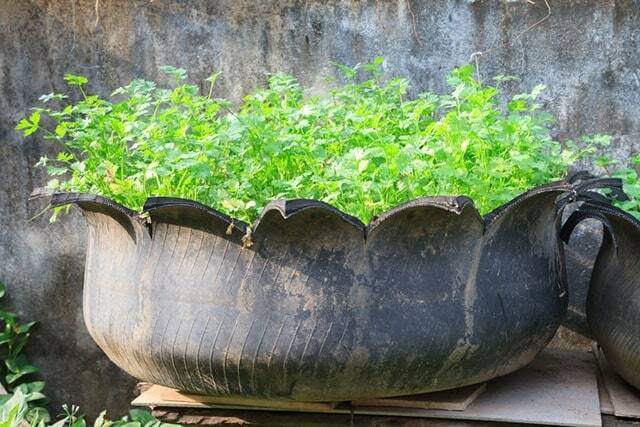 Here’s a super cool concept – intergrade small and large tires together to create a completely unique pot. You could almost fool your backyard barbecue guests into thinking this is an actual pot. Imagine their surprise when they discover the pot is made of tires? It’s a great idea and make it more customizable with an interesting paint job. Coffee lovers rejoice! Much like the whimsical teacup planter idea, create your own coffee cup planter out of old, used tires. Recreate your favorite mug or create a completely new coffee cup planter by using paint and other decorative materials you could easily find around your house. You could even construct one of these planters to give as a gift to that special coffee lover in your life. 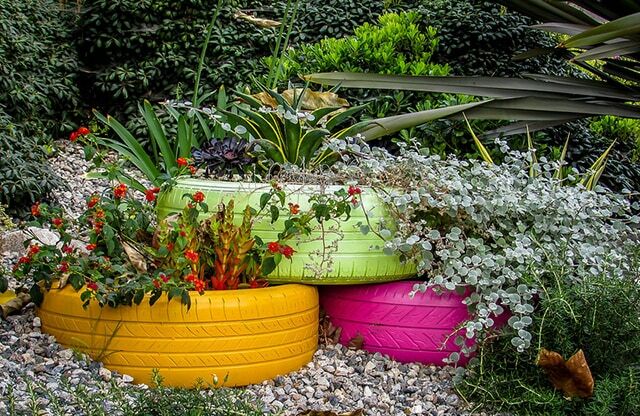 I can’t stress enough the myriad of color options you have to make these tire planters pop in your garden. Everything from garden turf to the actual plants inside the tires can make things very interesting. The brighter the paint on our tire planter, the more the colors of the plant inside will pop out at you. Mixing and matching colors will create a fun and beautiful theme to any garden space. Have an old tire rim you don’t know what to do with? Instead of trying to sell it on Ebay, turn it into a planter! Pairing a rim planter with your tire planters can be a fun concept, too, but even as a standalone this interesting planter will draw plenty of attention. These may be a bit more difficult to paint, but with such a brilliant metallic color, you may just want to leave these as is. In this photo, a large tire planter is painted to resemble bricks. This is a fun paint job that can easily be made your own by using interesting colors. The idea of a larger centerpiece tire planter with a bunch of smaller ones around it can also be an interesting focal point for your outdoor space. Stack the tires up high and customize it to create your own spread. Here’s a super cool idea for a larger garden space. Using your customized tire planters, stack them up to create your own garden retaining wall. Not only is this beautiful to look at, but this feature is easy to maintain. Once you water the top part of your retaining wall, the water will seep down the structure to ensure all your plants will be watered. Stack the tires as high or low as your like. 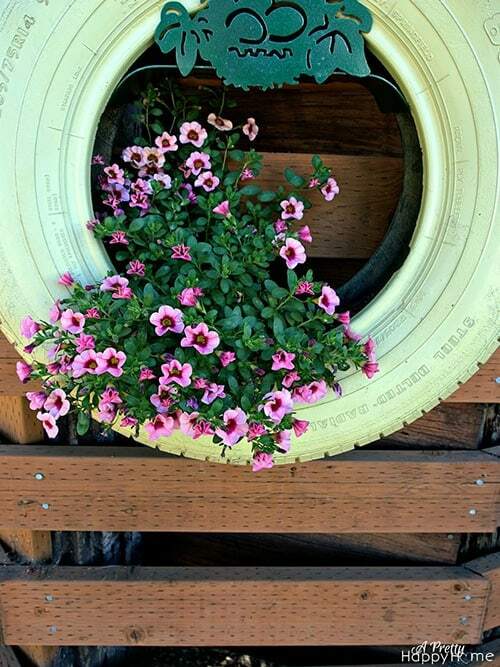 This is a super pretty idea for using a tire rim as a planter. 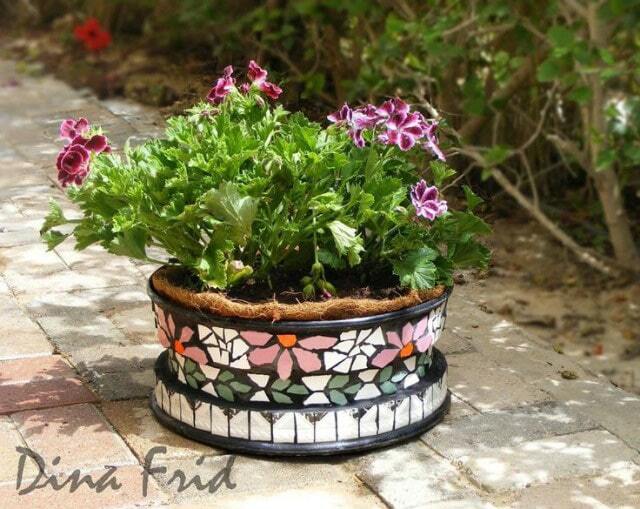 Using paint suitable for metallic objects, create a mosaic planter that will look like it’s actually tiled. Use all kinds of colors and designs to create this beautiful artwork that would look great on a patio or covered area. Your guests will do a double take since this pot will look so unique. 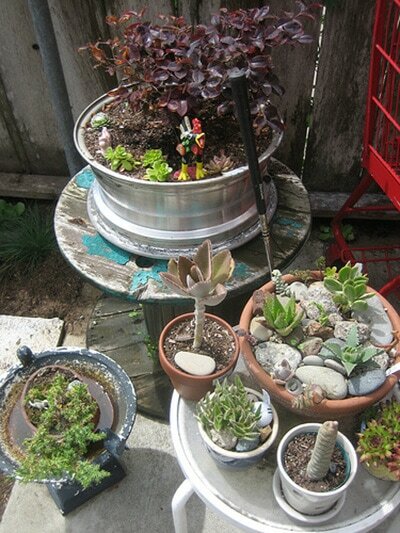 Hopefully, this list has inspired you enough to want to take on your own tire planter project! These are just a few ideas, but use your imagination to create a totally different concept. Again, you can feel extra great because not only are you creating art, but you are recycling old tires that would have ended up in a landfill somewhere. Since tires are also so sturdy, these planters will definitely last you a long time and even the kids can help out in making them. These tire planters are also safe from dogs or other pets knocking them over, and since they are made of rubber, no need to worry about broken pots anymore! Feel free to comment and share below! When you don’t paint the tires, they get hot in the summer and cook some of the plants. By painting them, will that help keep them from getting hot? how do you turn the tire inside out after cutting the petal design ? I love all these ideas! What kind of paint can I use for painting the tires?